I like to think I am a pretty food savvy girl. I really do. Ask me to make just about anything…and I can. I also manage to have my own ideas and make up my own recipes from time to time. So how is it that I have never managed to think of the idea of making my own granola…until now? See…it’s something that I have always loved – in every shape and form. In post after post, I’ve prattled on about my love of things that combine crunchy, salty, sweet, and sour. Ummm…hello? That’s the very definition of granola! I had been spoiled by the stuff that Big Sky Bread Company makes…but surely I could at least come close to that level of yumminess. I honestly didn’t know where to start…so I hit the Internet looking for a recipe I felt I could build on and customize. I also wanted to try and eliminate some of the so-bad-but-thats-what-makes-it-taste-so-good parts of most of the recipes I had come across. Katie Lee Joel (I still don’t know what I think about her but her granola is darned yummy, so at least there is that) contributed a recipe to Domino that looked like a good springboard for making my own flavor combination. I omitted the coconut – I’m kind of meh about it – and mixed up my own recipe using dried papaya, dried cranberries, and cashews. This stuff was delicious – and I was able to bake it a crispier level of doneness than most commercially-available granola. You can seriously use any mixture of fruits and nuts with the base of this granola and come out a winner – my next batch is going to have dried blueberries and almonds in it, for sure. – Preheat over to 350º. In a large bowl, mix together the oats, sunflower and pumpkin seeds, coconut, wheat germ, nuts, cinnamon, and salt. In a small saucepan melt butter in the maple syrup over low heat. Stir in the vanilla. Add to the oat mixture. Add 2 tablespoons water and stir until well combined. Spread the granola evenly on a large baking sheet. Bake for 30 minutes, stirring at 10-minute intervals to ensure uniform baking, until golden brown. Remove from oven and cool in the pan. 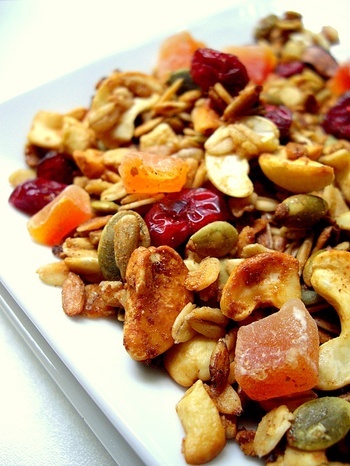 Stir in the dried fruits. Store in an air-tight container. I’m with you… I recently discovered how wonderful homemade granola is and can’t believe I had never tried making it sooner! Your (Katie’s) version sounds wonderful. I’m a little iffy about coconut too. This recipe looks so great, I really hate to be the one to mention that it’s actually 60% fat! There’s just no way to have all those yummy nuts & seeds without stacking up the fat grams… My count on this (using fitday.com) came to 455 calories, and a whopping 32g fat per 1 C serving. Obviously you could cut that to a 1/2 C serving, but 16g of fat is still going to do a number on your day’s intake! I’m bummed, b/c it looks soooo good! I love that photo! YUM. I love your blog! My name is Hannah Huffines and I represent Concentrics Restaurants and Whynatte Latte (soon to launch!). I would love to include you in our Whynatte Latte media sneak taste event this November 13th. What email would you prefer I send the invite to? Let me know at hannah@whynatte.com or 678.488.2909. I don’t know how I feel about Katie Lee Joel either, Tami. I’ve never made granola…I’ll have to book mark this and see what happens. What a great photo! Then again, all of your photos look wonderful! I’m not a coconut fan either, but this recipe sounds great! Yummy, so easy, so delicious. Coconut should be eaten raw, or shredded in cakes. Not baked alone. Looking forward to your next post.. whenever that will be.